With an award winning production staff, "Front Page" is at the forefront of new innovations in a variety of fields. Hosted by esteemed actor, James Earl Jones, "Front Page" produces high quality programming to Public Television stations nationwide. The award-winning series takes an in depth look at each industry and provides useful and educational content for the viewer. "Front Page" will air their interview and discussion with RawTrition founder, Kairi Jeffries, Thursday, January 25, 2018 at 11:29 PM Eastern, 10:29 PM Central, 9:29 PM Mountain and 8:29 PM Pacific Time. "People are demanding more than ever for healthy, organically sourced, non-GMO alternatives for food in their everyday diets because they are so superior. So why would you not expect the same from your nutritional supplements as well? With RawTrition BioEnergy you get that! And that is one reason why I love it and have made it my staple daily supplement." said Dr. Lauren Fries from CliniCube NYC in New York, NY. RawTrition™ is passionate about providing a healthy alternative to supplements. 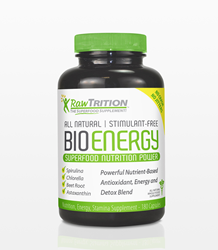 Made from a unique blend of superfood water-based plants called micro algae and other superfoods which are organically sourced, contains no synthetic isolates and is 100% non-GMO, RawTrition™ BioEnergy helps people get back to feeling healthy, energetic, and clean without the jitters or crash associated with artificial stimulants. This product helps resolve many every day ailments and common issues through its unique formula of basic raw nutrients. For more information, visit: http://www.rawtrition.net or call (888) 490-0678.